With the introduction of our latest tool to find levidromes, we decided to write a followup article about levidromes in the wild. Levidromes are pretty cool. However, standing by themselves without their levidromic partner present, they are just ordinary words. For the most part, you wouldn't even give them a second glance when using them in normal writing or publishing. There are levidromes in most written publications, from the King James Bible, to the works of Shakespeare to the front page of the New York Times. However, the true magic of a levidrome occurs when the matching pair of a levidrome sneaks onto the page. The closer to the matching pair, the more "magical". Dennis sinned. Now that is a purist form of a levidrome pair. It is a complete sentence, composed only of levidromes. Not bad. Not bad? Wait, if you didn't quite catch it, the words "Not Bad" are also both levidromes...not (ton) and bad (dab). Also a "purist" sentence, because both words are levidromes. However, the spark of the magic is somewhat diminished because their pairs were nowhere to be seen. If a sentence has both pairs of the levidrome, it is truly a magical sentence. The "Whoa" factor. If not in a sentence, then perhaps in a paragraph? If a paragraph has both pairs of a levidrome making their appearances, the magic is still there. However, if the levidromic pairs appear way across a document from one another, it just becomes a "cool" moment, assuming that you found them. I suppose that is why the phenomenom of levidromes in the wild are difficult to spot. They are everywhere, but you need to be looking for them in order to make the connections. Accidental placements of levidrome pairs are extraordinarily phenomenal, because that is when the magic really happens. The author unintentially uses both pairs of a levidrome close enough to each other that a wary reader will recognize them. Those are wild levidromes. No planning. No preparation. Just luck of the draw. 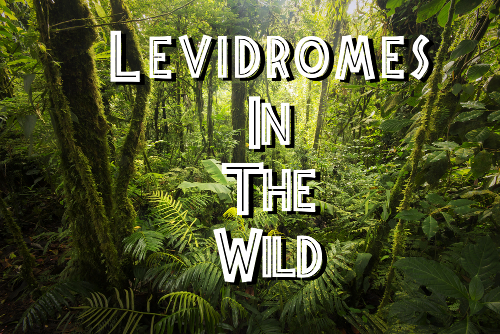 The levidrome finder tool we developed will help find those levidromes in the wild, and if their levidromic pair is in your text selection, then it will help you find those magical instances.